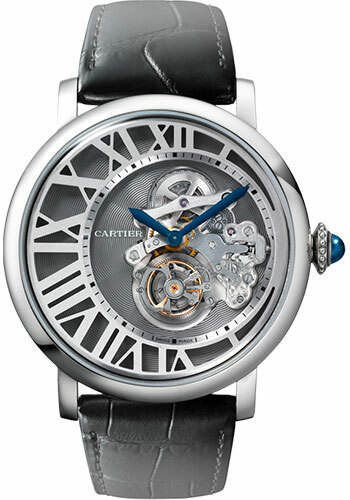 46.2mm 18K white gold case, 12.75mm thick, sapphire back, beaded crown set with a sapphire, sapphire crystal, slate dial with 18K white gold grid in the form of Roman numerals, circular-brushed finish, sword-shaped blued-steel hands, caliber 9458 MC manual movement, approximately 50 hours of power reserve, black alligator strap, double adjustable deployant buckle in 18K white gold. Water resistant to 30 meters. 46mm 18K white gold case, 12.73mm thick, sapphire back, beaded 18K white gold crown set with a blue sapphire cabochon, 18K white gold bezel, sapphire crystal, silver dial, caliber 9458 manual-winding movement with blued-steel sword-shaped hands, approximately 50 hours of power reserve, black alligator skin strap, double adjustable folding buckle. Water resistant to 3 bar.